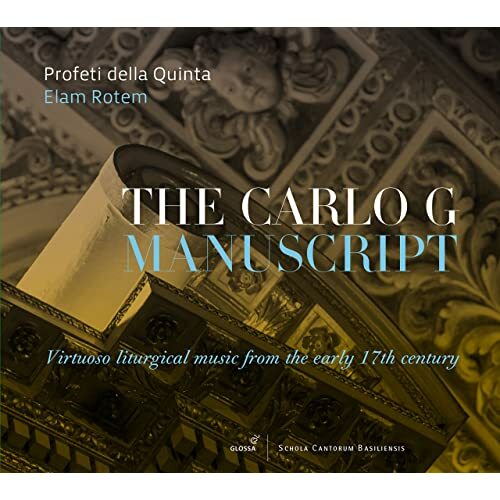 Fifteen years ago, a music manuscript was bought at a flea market outside of Vienna for 50 Euros; it turns out to be a previously unknown Italian composer from around 1600. This week: the world premiere recording. This recording is on the Glossa label and is CD GCD 922516. Some 15 years ago, the hitherto unknown "Carlo G Manuscript" was purchased at a Vienna jumble sale for the princely sum of 60 euros. Once a doctoral thesis has been prepared based on this document and it had been made available on the internet in the form of scanned images, the manuscript was sold by Sotheby's at auction to an anonymous buyer in 2007, as a consequence of which it has once again disappeared. The fact that the surname of its author had become illegible as a result of a smudge deepens the mystery surrounding the manuscript even further - however, although being from the same time as that of the famous Carlo Gesualdo, everything points to the fact the prince of Venosa was not the composer being searched for... An extensive selection of pieces from the manuscript can now be heard courtesy of the Schola Cantorum Basiliensis, performed by the ensemble Profeti della Quinta, and directed by the organist Elam Rotem. These are liturgical pieces dating from the early seventeenth century which undoubtedly would have sounded in Central Italy in a very similar from to what can be heard on this recording: one of the manuscript's peculiar characteristics is that it includes, exactly - note for note - what is expected from the singers and organist. This embraces the complex ornamentations which, by and large, musicians would improvise and wouldn't be written down. The acoustic of the Chiesa dei Santi Eusebio e Vittore de Peglio, Italy provides added authenticity to a project which is entrancing from every angle.